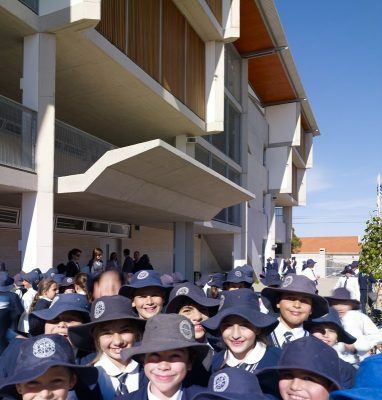 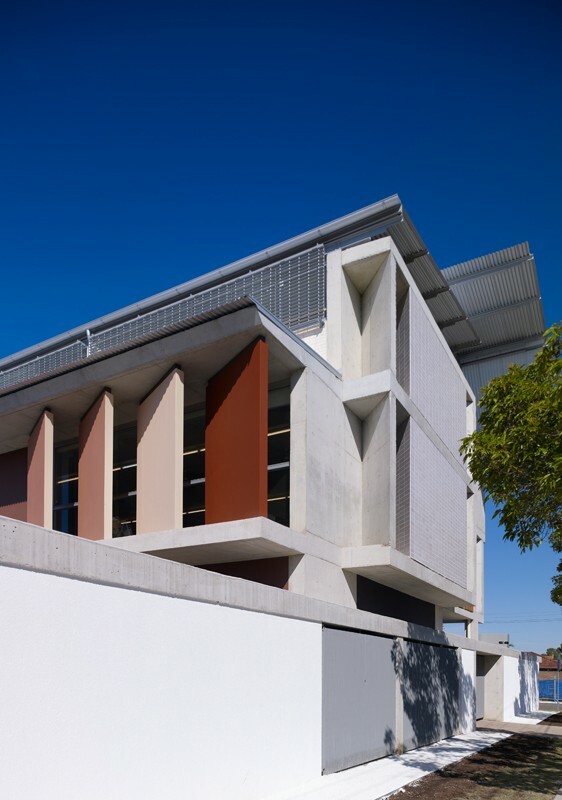 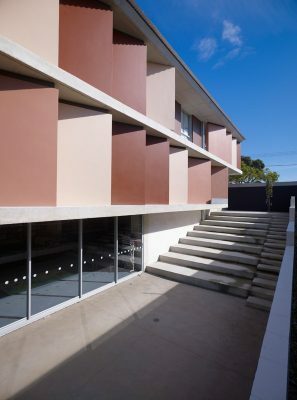 The completion of the initial All Saints Primary School building represents the first stage in the establishment of the new All Saints Primary School campus and with it the Greek Orthodox Church achieved the first part of a long term goal to commence the establishment of a cultural precinct around the existing All Saints Church. 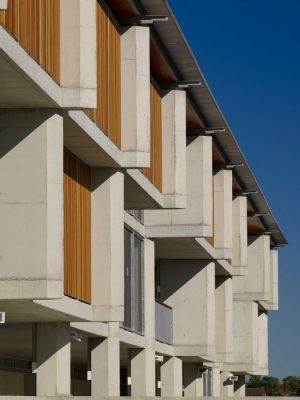 Completion of the project in entirety will see further institutional and educational buildings including significant public domain and landscaping works. 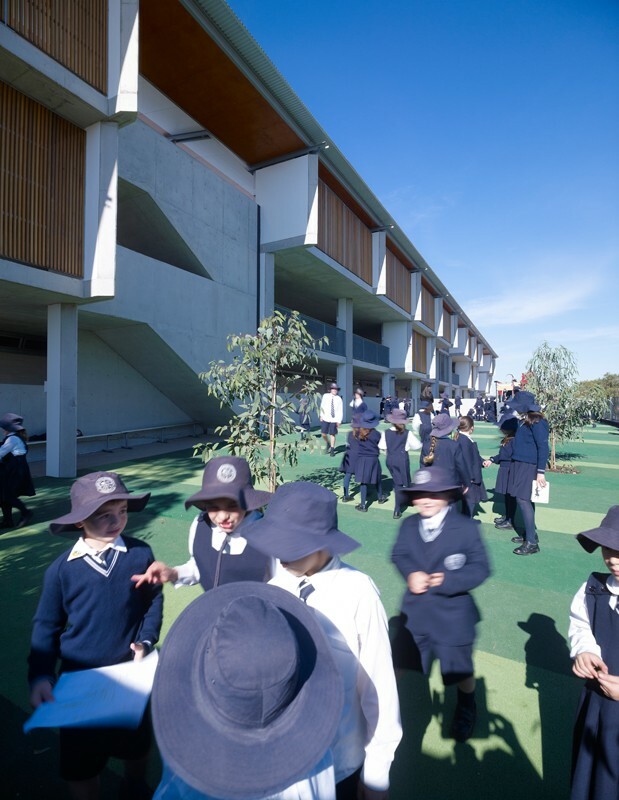 The primary school building is a simple narrow extruded form approximately 80 metres in length, teaching spaces are located over four levels accessed from continuous external walkways to the west. As the students and their teachers inhabit the building further from the primary external spaces at ground level the stepping walkway section which increases to up to 5.5m in width across the length of the building is designed to provide additional external teaching spaces. 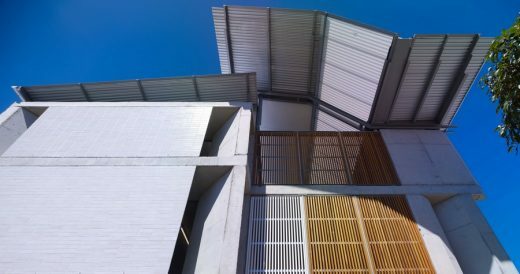 This sectional diagram increases the number of potential teaching environments, allowing building occupants flexibility to respond to varying climatic conditions. 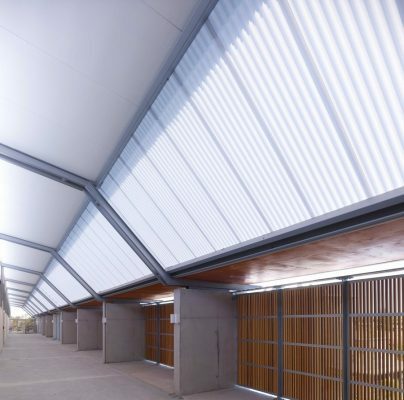 The design team were challenged to provide specific levels of luminance such that the technical equipment could function whilst concurrently maintaining pleasant teaching environments. Reflected daylight is bounced in to the plan by angled coloured fin blade walls on the eastern façade, this moderates high internal daylight and sunlight levels whilst providing the required daytime luminance, the colour variation to the fins providing an individual character to each classroom. 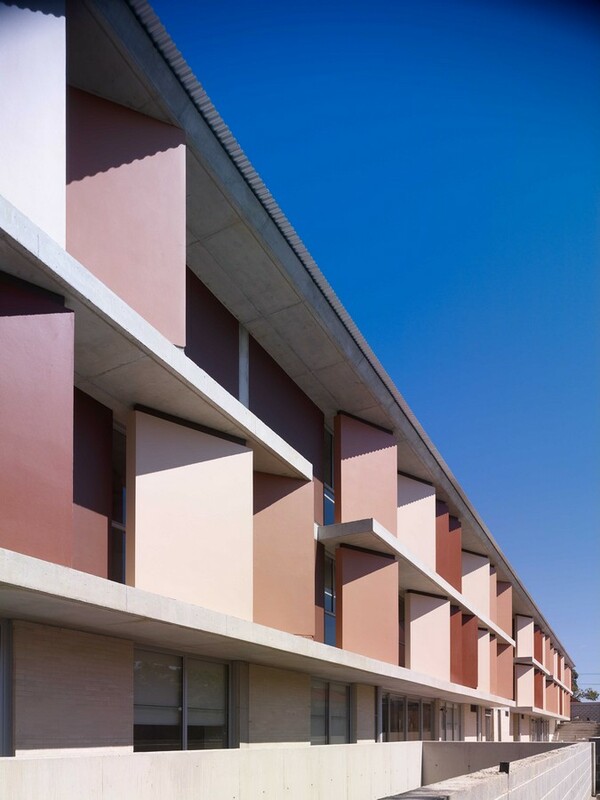 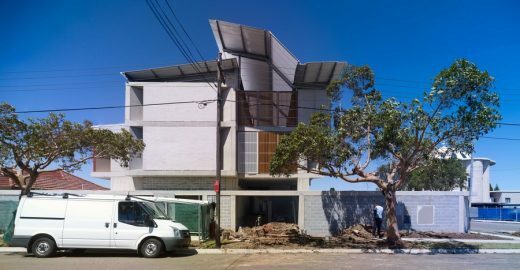 The coloured fins also act to control solar gain and provide visual privacy to adjacent residential properties by directing internal views appropriately. 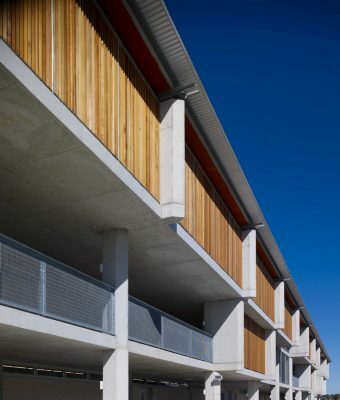 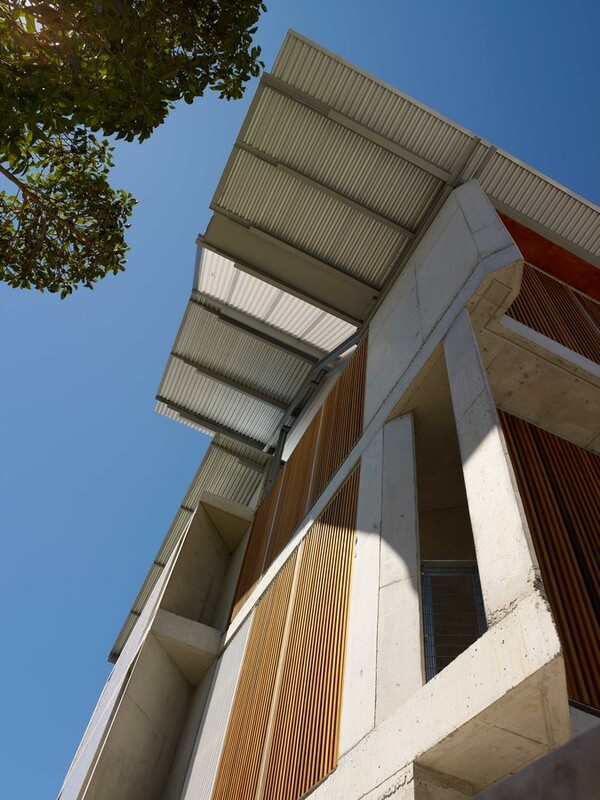 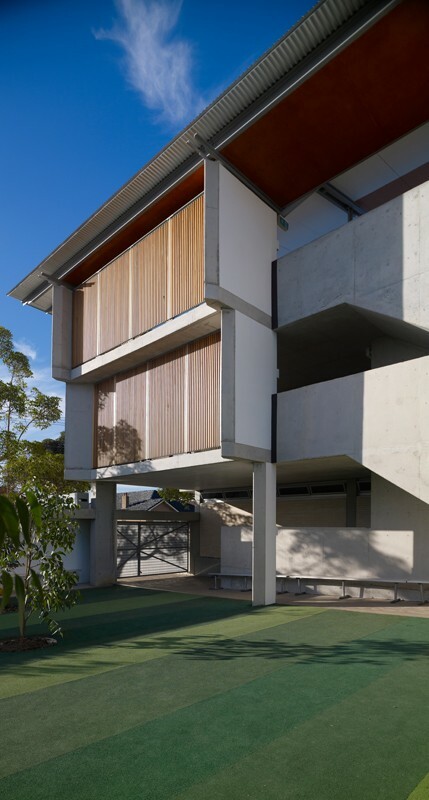 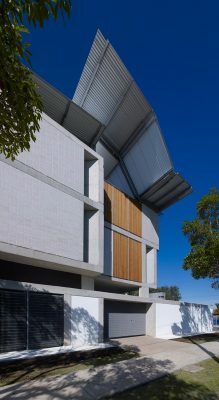 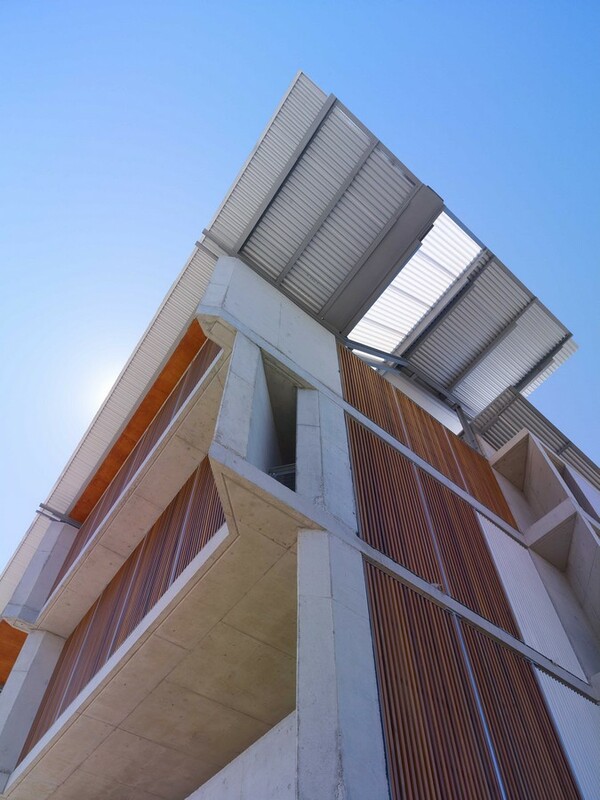 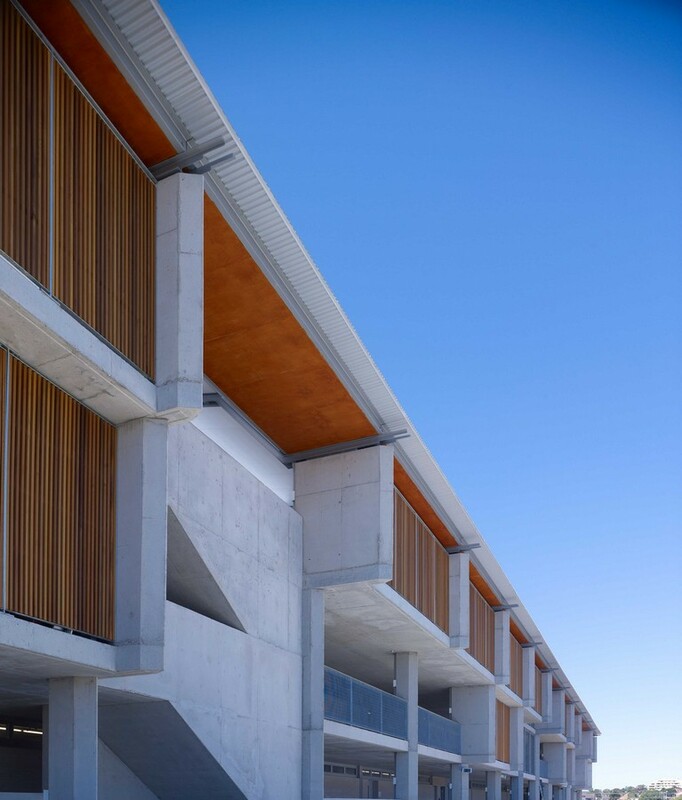 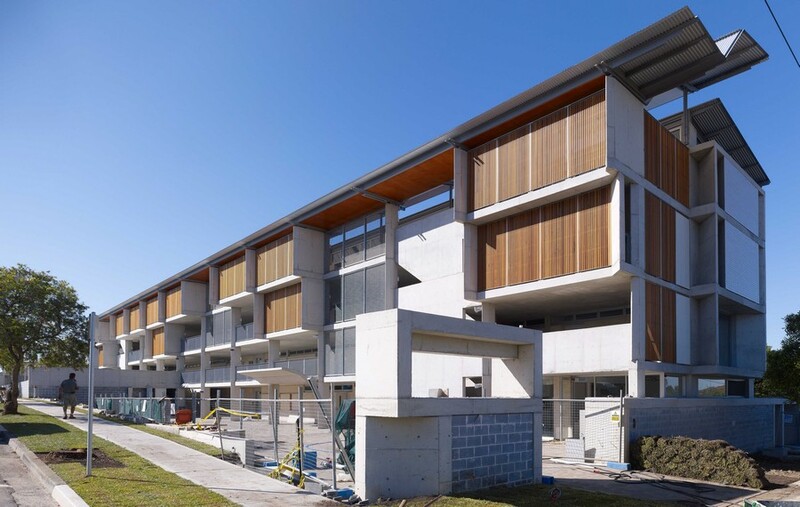 The western façade and external teaching spaces are protected from solar gains by vertical timber battens and steel mesh screens across the façade. 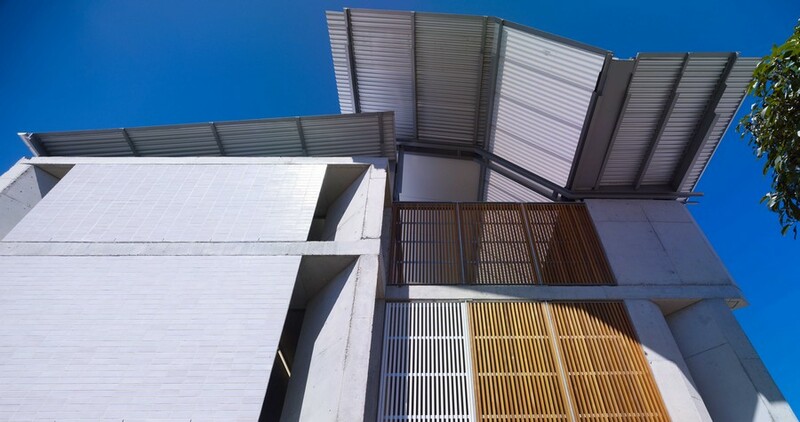 The proportion and orientation of the building provides all spaces with dual aspect promoting cross ventilation, which in conjunction with appropriately located exposed high thermal mass surfaces, solar control devices and ceiling fans successfully provides a high degree of thermal comfort to building occupants. The expansive roof which runs the length of the site is used to collect and recycle rain water. 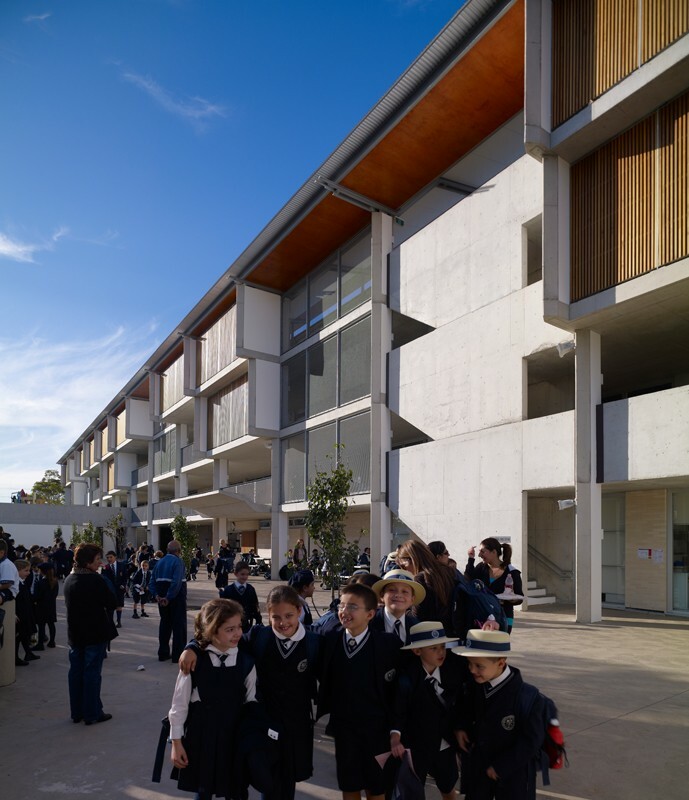 The client and the architect agreed from an early stage that a school should be a stable structure in repose, that it should not be lightweight and that it should stand largely against time though with the accumulation of a material patina. 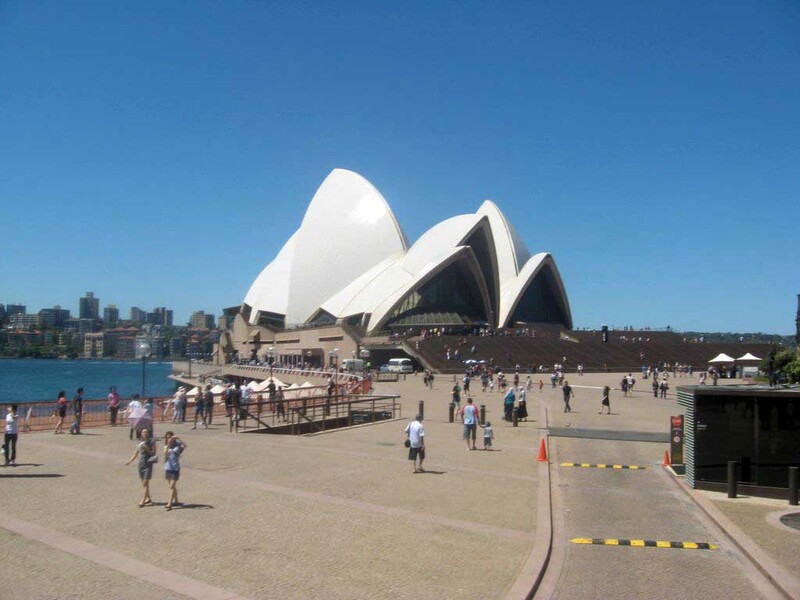 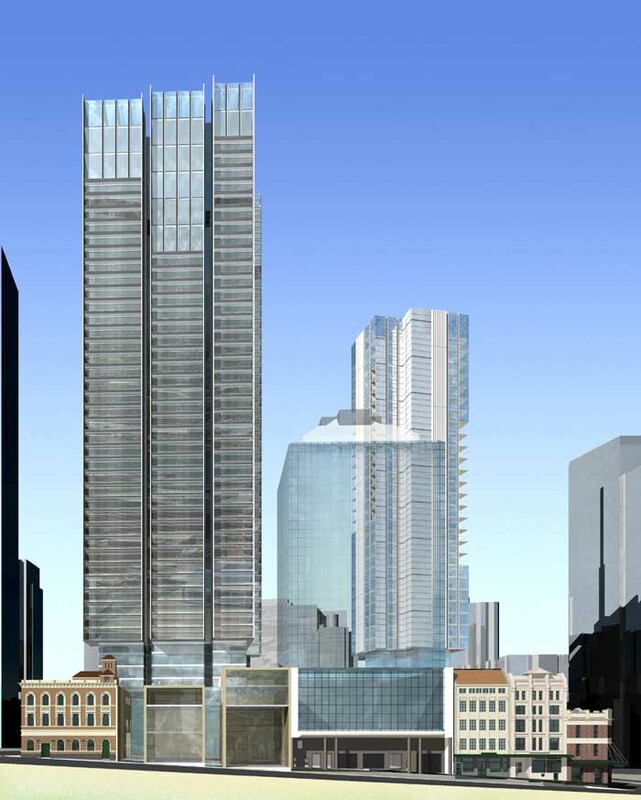 The brief stipulated that the building should function for at least one hundred years. 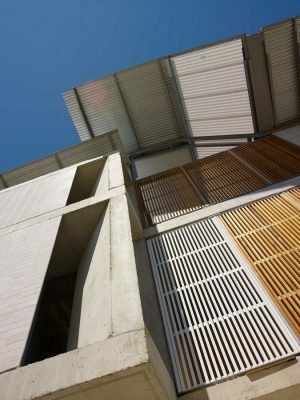 To this end the materials were selected and the construction was composed to achieve a robustness tempered by a material and chromatic warmth and with a poetic playfulness that was considered appropriate for such an institution. Stretching a penny with all of the project team, a school was made and we hope all who attend will be inspired by and recall fondly the experience over the next hundred years.